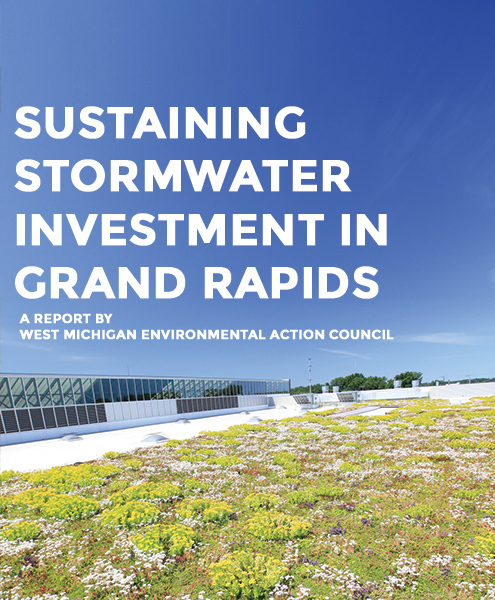 WMEAC, with funding through the Dyer Ives Foundation, looked across the nation for best practices in ways to both sustain stormwater investment, and to get the most from the investments Grand Rapids has already made. Pick up pet waste and dispose in a trash can, don’t leave it on the ground. When using fertilizers, choose slow-or timed-release, phosphorus-free fertilizers and always apply according to instructions. Don’t flush old medicine, go to wmtakebackmeds.org for drop-off locations. Use a rain barrel to collect runoff and prevent it from entering the watershed. The rain water collected can be used to water gardens and lawns. Wash your car on the lawn or gravel, not your driveway. Always use non-toxic, biodegradable soaps when washing vehicles or outside surfaces. Take household hazardous wastes, like used engine oil and leftover paint, to a recycling collection center. Minimize use of salt for snow and ice control. Use magnesium or calcium chloride alternatives if possible. Reduce the amount of lawn in your yard by adding flowers, herbs, and native plant gardens. Always pick up litter from the ground, to prevent it from getting into waterways. Choose gravel or paving stones instead of concrete, where possible. Never dump anything down a storm sewer or drain.